The Democratic Republic of Congo (DRC) is the second most populous country in sub-Saharan Africa, with an estimated total population of 71 million people – 47% of which are under the age of 15. In the past, DRC has experienced significant political turbulence and instability, particularly in eastern Congo, and as of 2014 is placed at 186 of 187 countries according to UNDP’s Human Development Index. IMA World Health (IMA) began working in the DRC in 2000 to rebuild 60 health zones and continues our work today to improve access to health services. We are a recognized leader in partnering with the Ministry of Health (MOH), donors, faith-based and non faith-based organizations to strengthen health systems for improved delivery of services to address primary health care, HIV/AIDS, malaria, neglected tropical diseases (NTD), and sexual and gender based violence (SGBV). Using a health systems strengthening approach, the ASSP project collaborates with the MOH at all levels of service delivery, including the national and provincial levels and with focused support to health zone, health facility and community levels. IMA and its partners ensure that more than 75% of the project resources are concentrated within the health zones for service delivery, empowerment, accountability and capacity building of local community service organizations, partners and MOH representatives. 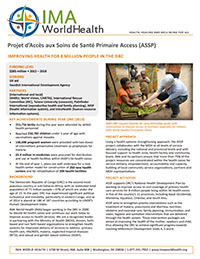 ASSP supports DRC’s National Health Development Plan by working to improve access to and coverage of primary health care services for 8 million people living within 56 health zones in five of the country’s 11 provinces, including Kasaï Occidental, Maniema, Equateur, Oriental, and South Kivu. ASSP aims to strengthen priority interventions such as the treatment of malaria, pneumonia and diarrhea, nutrition, obstetric and neonatal care, family planning, immunization, and water, hygiene and sanitation interventions that are delivered through the health system. These intervention packages are aimed at improving the health of the mother, newborn and child, thus allowing the DRC to achieve significant progress towards reaching Millennium Development Goals 4, 5 and 6. Click here for a pdf with more information about the project.